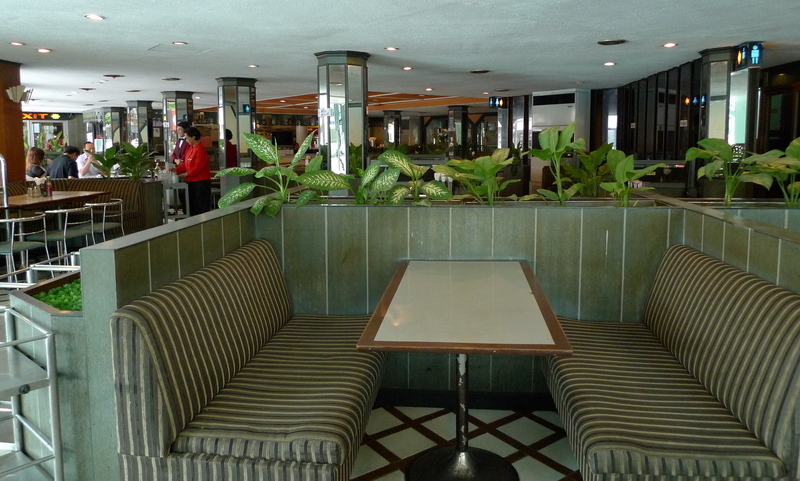 Yesterday I promised a retro meal and this is just the place for it: the Rex Hotel, an establishment that dates from the 1960s, one of a large number of hotels that offered fixed rates for foreign GIs who were on rest and relaxation breaks during the Vietnam War. The Rex Hotel is still in business, still owned by the original family, in fact. It has undergone some remodels but has never lost that 1960s charm. Its coffee shop, the Rexa Coffee Hall, is still famous for its khao tom, boiled rice. 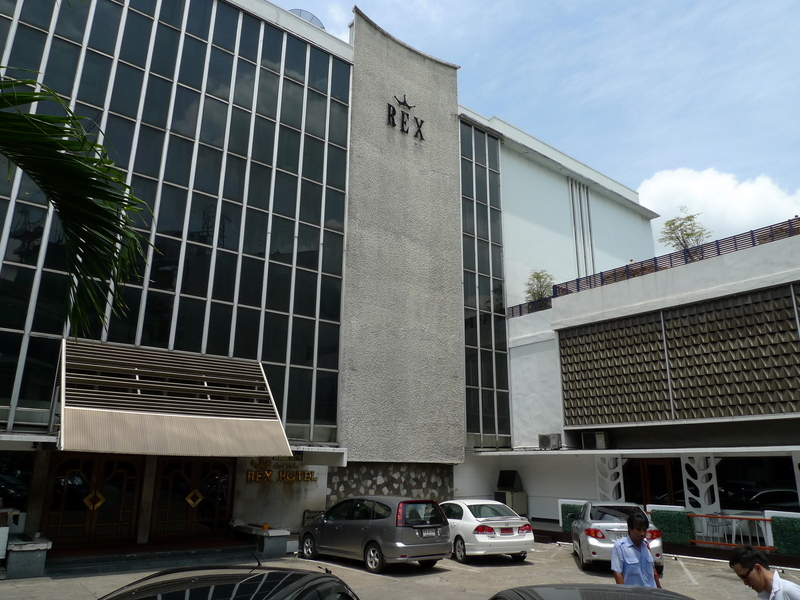 Located on Sukhumvit Road between Sukhumvit Soi 32 and 34, the Rex Hotel is just a short walk from the Thong Lo BTS Skytrain station. Despite fresh coats of paint, the Rexa Coffee Hall screams 1960s with its delightfully unselfconscious menu design, booth upholstery, and table dividers. We ate at an off hour and there was only one other group dining. The Rex Hotel focuses mostly on package tour groups these days and with tourism way down, I’m sure there is a low occupancy level. Notice the staff, wearing the classic red jackets and bow ties. The Rexa Coffee Hall has a wide menu of both Thai and Western items – eight types of sandwiches, for example – all of which are decent without being flashy and all of which are inexpensive. 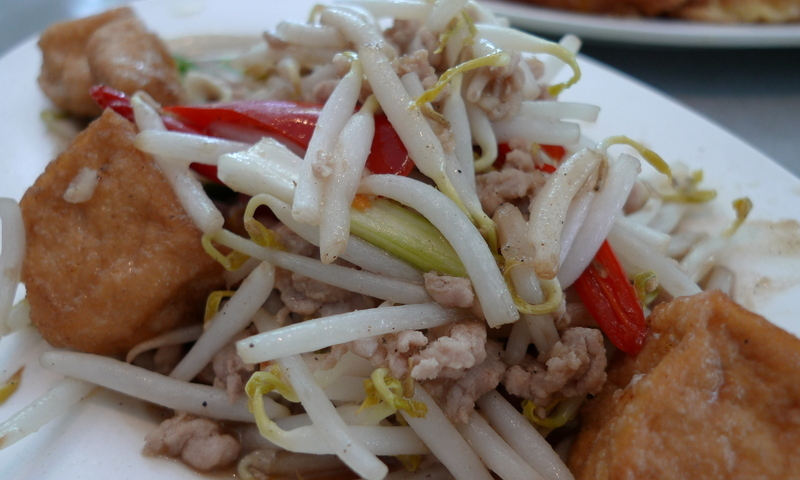 They are most famous for their boiled rice, khao tom, a Thai breakfast favorite. The rice porridge is served with a variety of side dishes. You can mix and match to get whatever flavors you want to contrast with the backdrop of bland rice. One must-try is jab chai, which literally means “leftovers”. 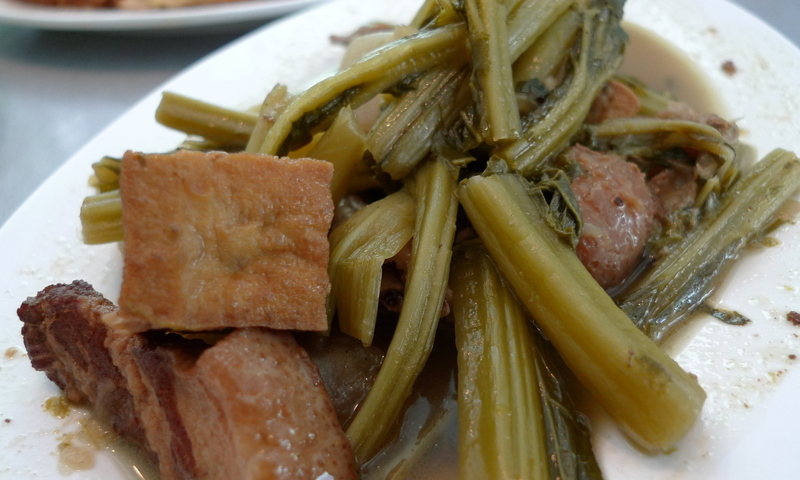 A mixture of whatever is left over, the Rexa’s version includes bitter greens stewed with tofu, pork belly, and chicken feet. Not very pretty but it is very tasty. Pad tua ngoc – Bean sprouts stir-fried with pork and tofu. Clean flavors and very refreshing. Kai jiaow – omelet with fried pork Omelets here are fried in plenty of oil but they always seem to come out without being oily. I guess they keep the pan really hot. The Rexa is going to get some return visits from me. With a menu so inexpensive and varied and a location so close to my home, it would be a good break for when I need to get out of the house for lunch. I’m on my way to the United States today so there may be a few days without an entry. Stay tuned, though. Next stop, Omaha. This entry was posted in Uncategorized and tagged Bangkok, Dining, food, Krungthep, Rex Hotel, Rexa Coffee Hall, Thailand by christao408. Bookmark the permalink. Interesting 1960’s decor, I like the ‘gun chien tod’, great with steamed rice. Have a good flight! Food looks lovely as usual. Is the boiled rice different from rice porridge? My parents call it 稀飯 (xī fàn). Unless I’m missing something, I don’t understand how it could be famous for something so plain as boiled rice.Have a safe trip! Boiled rice…is that the same thing as jook? Not sure if you know what I’m referring to, but it looks like that and it’s something I eat when I’m sick haha. 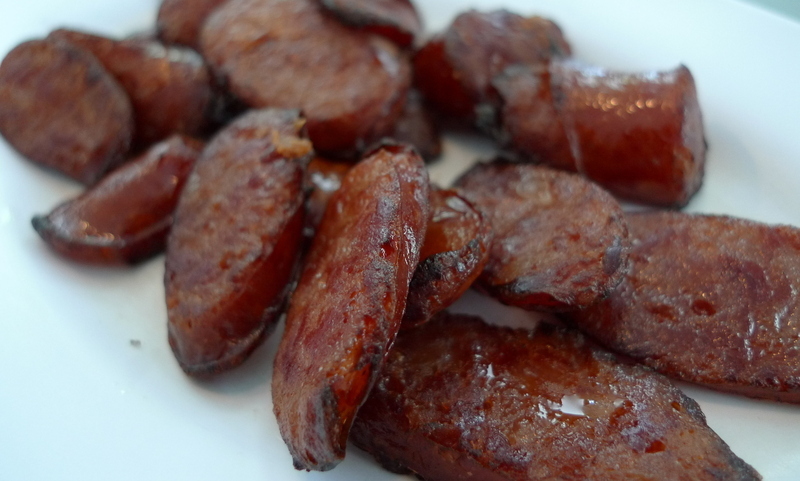 @Senlin – @Roadlesstaken – The side dishes is what it is famous for, not the rice itself. 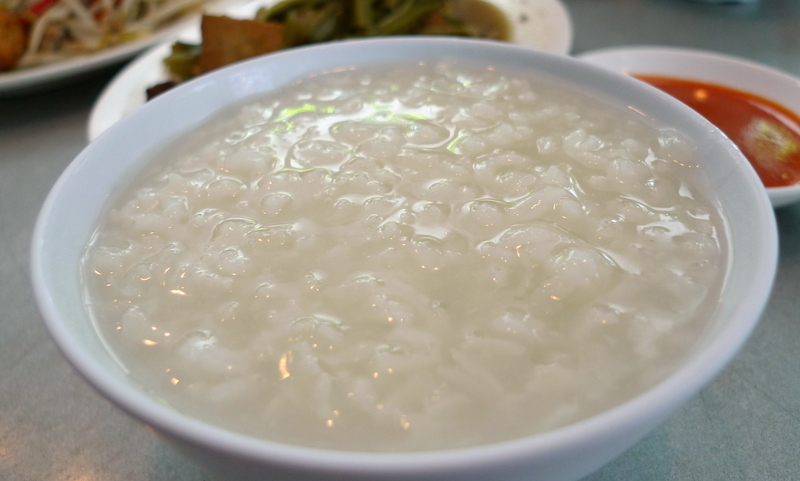 The boiled rice is different from what I know as “congee” or “jok” in that it is more watery, literally water in rice instead of a kind of broken-down porridge. Don’t know how that relates to the 稀飯. @Chatamanda – Oh, no meat? Hmmm… maybe just the rice, then! The Thais use fish sauce in nearly everything so I’m not sure how strict you are but you might have a hard time staying absolutely, completely vegetarian. 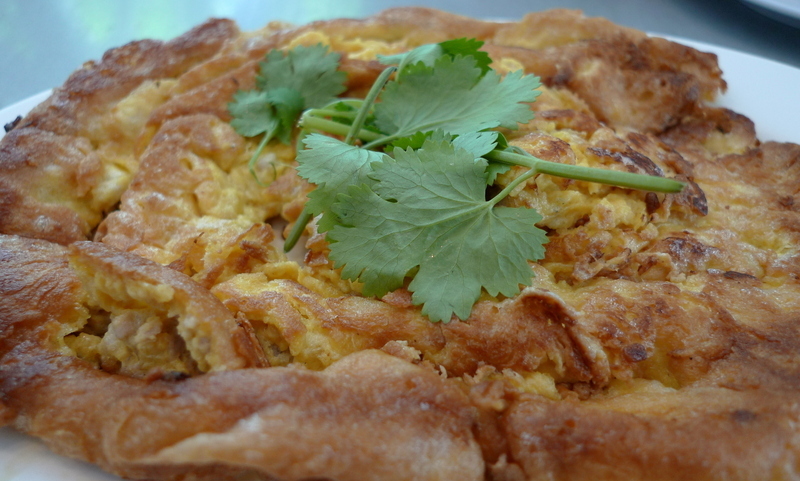 @CurryPuffy – It is one of my favorites but not so good for you. Which is why it is one of my favorites, I guess! LOL I’ll have a good flight and see you in a few weeks. Nice dishes to go with porridge! I miss those sausages. I used to eat them all the time in Taiwan. I love, love, love the 60s interior and menus. Why fix it if it ain’t broke? Hope you have a safe trip! Love those 60s colors! Yum, tofu, seafood, fresh sprouts, rice. I’m movin’ in. Need a housekeeper? @csn71650 – You found the answer to that question, huh? Ha ha…@TheCheshireGrins – Exactly – let’s keep it going as is so long as it works. i love the boiled rice breakfast. i couldn’t get enough of it in china. has a different name in kuming and beijenf i put the chopped onions etc on it don’t like it will all the sweet fruit or with the chicken . i had it every morning with freshly made cucumber juice. @grannykaren – It is funny how some people love boiled rice and others hate it. I’m an oatmeal person myself so boiled rice doesn’t seem all that different. @christao408 – hahahahaha looks like we have something in common i love oatmeal and grits and all the other hot cereals cream of wheat being my least favorite and a multigrain cereal with oats and rye my favorite. i used to make the rice cereal but haven’t in a long time. mostly make oatmeal with cinnemon no milk no sugar. don’t like milk and sugar on my hot cereal.